The Senate committee looking into the decision to delay last spring’s release of information on E. coli contamination at the Lake of the Ozarks isn’t quite finished with its effort to get to the bottom of the withholding of data. Senator Brad Lager (R-Savannah), Chairman of the Senate Commerce, Consumer Protection, Energy and the Environment Committee, still hopes to hear from past or present Department of Natural Resources employees who could add to what is publicly known. On the eve of start of the 2010 legislative session the Senate committee looking into delays in the release of information on the E. coli contamination at the Lake of the Ozarks hears from a former state official who accepts full responsibility. Governor Jay Nixon is taking responsibility for the withholding of information regarding E. coli contamination at the Lake of the Ozarks earlier this year, and has – in effect – pointed the finger at a longtime aide. Joe Bindbeutel, who was Deputy Director of the Department of Natural Resources when the information was withheld, had been appointed to a post as an administrative law judge, a job that is subject to Senate confirmation. But Nixon has withdrawn the nomination as a result of an internal investigation on what happened following the discovery of those high E. coli levels. At a Friday morning news conference in his Capitol office, the Governor also announced that he is reinstating suspended DNR Director Mark Templeton next week. Nixon pointed to what he claims is a systemic failure regarding the reporting of contamination information from the Lake of the Ozarks. Nixon says the problem goes back at least to 2005. While he takes responsibility for what happened earlier this year, Nixon points to communications problems and “breakdowns” that stood in the way of the full information being made available. At least two members of Nixon’s inner circle were aware of the findings from the Lake and sat on those results. But they have not been disciplined for their actions. A State Senate committee investigating the withholding continues its work. Chairman Senator Brad Lager (R-Savannah) claims there has been a cover-up. A State Senator heading a committee looking into the release of E. coli testing results at the Lake of the Ozarks claims there has been an organized cover-up. Senator Brad Lager (R-Savannah) says the Department of Natural Resources has played a key role in standing in the way of the committee that is learning why the release of the results was delayed. “Since this review began in late July, early August, clearly DNR has made every effort to make this a difficult process,” said Lager in an interview with the Missourinet. Lager has no doubt this is intentional. “As we requested emails, as we asked for interviews of employees – all the things that should be very simple when the legislative body is working with a department – there has been time and time again when they have done everything they can to try to derail this process,” said Lager. There is more fallout from the withholding of information regarding contamination at the Lake of the Ozarks prior to the Memorial Day weekend. Two Department of Natural Resources employees have been placed on administrative leave without pay for five days. According to a DNR press release, the action is based on initial findings from an ongoing investigation into the department’s failure to close beaches in May, following samplings that showed high levels of E. coli bacteria. DNR is not releasing the names of the employees and will not provide any other details. The action comes just days after DNR Director Mark Templeton was suspended for two weeks for his role in the affair. Nixon Administration officials attempt to explain why contamination at the Lake of the Ozarks wasn’t reported promptly even as the governor orders an investigation of the Department of Natural Resources. Officials within the Nixon Administration denied they knew about contamination at the Lake of the Ozarks until a month after readings were taken. Then a transcript of an interview with former DNR spokeswoman Susanne Medley became public, revealing she had told top Nixon aide Jeff Mazur about elevated E. coli levels early on. Mazur says he didn’t pass the information along to others in Nixon’s office. "I did not," Mazur tells reporters both gathered in the governor’s office and on a conference call. "I didn’t feel as though I had anything to share. I didn’t have any numbers. I didn’t have any paper. I didn’t have tangible results. It was made clear to me that these were results on which there wasn’t sufficient information for any conclusions to be drawn." Mazur terms the Medley meeting on May 29th a "heads up" and claims he didn’t actually see results until four weeks later. "She gave me a heads up that they had initial results," Mazur explains. "This was in late May, May 29th, May 28th. I saw the release, it must have been June 24th or 25th, I can’t remember which date it was. It was the day before the release ultimately was issued." The Springfield News-Leader reported earlier that Medley revealed her discussion with Mazur to the staff of a Senate committee reviewing the DNR’s decision to delay release of the contamination report. The newspaper obtained a transcript through a Sunshine Law request. Medley resigned just prior to talking with committee staff. In the interview, Medley said she told Mazur about the elevated E. coli levels during a telephone conversation and supplied periodic updates about the test results to Mazur. The Kansas City Star also reported on the interview. Governor Nixon complains that DNR gave him faulty information. Nixon has ordered an investigation of the department and has suspended DNR Director Mark Templeton, a suspension Templeton accepts. "I said that I passed the information from people in my department to the governor’s office," Templeton says. "Accountability is appropriate." Deputy DNR Director Bill Bryan has been appointed acting director. Nixon has asked him and Department of Corrections Inspector General Chris Pickering to conduct a thorough investigation and to punish those responsible. Department of Insurance spokesman Travis Ford has been assigned duties as DNR communications director in the interim. A state senator heading a review of why the Department of Natural Resources withheld a report on contamination at the Lake of the Ozarks says the most recent revelations confirm the need for a Senate review. 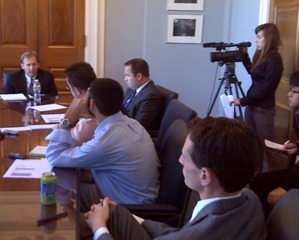 A review of DNR action by the Senate Committee on Commerce, Consumer Protection and the Environment began in late July. Chairman Brad Lager (R-Savannah) refuses to call it an investigation, insisting the committee simply wants to know what broke down, where it broke down and should public policy change to keep it from breaking down in the future. DNR withheld information about elevated E. coli levels at the Lake of the Ozarks for four weeks. It came to light late last week that a former top DNR official informed a top aide of Governor Nixon about the problem on May 29th. The interview former DNR Communications Director Susanne Medley gave to Senate committee staff members contradicts the insistence of the governor’s office that it didn’t know until June 23rd that DNR withheld the report. Medley told Senate staffers that she spoke with Jeff Mazur, a member of the governor’s communications office on the 29th, the day after she found out about the report. Revelations that Governor Nixon’s office knew early on confirm Lager’s belief that the probe is needed. “And the reason that that is so important is because this is not about pointing a finger at somebody and saying, ‘It’s this person’s fault.’ This is about understanding where the public trust was violated and then making sure that never happens again,” says Lager. Lager doesn’t want to rush the review, which he says has been slowed because DNR hasn’t cooperated. “What is very clear to me is DNR has made a conscious decision to not be candid, to not be open and to not be honest,” Lager says. Lager adds that after DNR drug its feet, it then dumped nearly half a million e-mails on the committee, yet still might be keeping e-mail correspondence vital to the review from committee staff members. Staff members with the committee have been interviewing DNR personnel and reading e-mails. Gov. Nixon held a news conference last week to announce an initiative to improve water quality at the Lake of the Ozarks. The four-part plan begins with the inspection of about 400 area facilities that hold wastewater permits close to the Lake of the Ozarks of major tributaries. Lager says he’s not sure the plan adequately addresses public safety concerns at the lake. He advocates a state government policy that works with communities at the Lake of the Ozark to police contamination. It appears Governor Nixon’s office did know, early on, that high E. coli levels threatened the public’s safety at the Lake of the Ozarks. The Springfield News-Leader and the Kansas City Star report that a former Department of Natural Resources official told Senate committee staff that she notified a top aide to Governor Nixon about the elevated levels on May 29th. The governor’s office has asserted repeatedly that it didn’t know about the problem until June 23rd. DNR has admitted it kept the information from the public for four weeks, worried that it would hurt tourism at the lake. Both The News-Leader and The Star say they used a Sunshine Law request to obtain a transcript of the interview between Senate staff and former DNR communications director Susanne Medley, who resigned abruptly last week. Medley told staff she informed top Nixon aide Jeff Mazur about the contamination on May 29th, a day after she learned of them. Medley further stated that she kept Mazur abreast of additional E. coli test results. Medley adds that Mazur instructed her on June 26th to keep any news about high levels of E. coli from the state’s largest media outlets. DNR released the test results for both May and June later that day. The Nixon Administration has steadfastly denied knowing about the E. coli report and DNR’s withholding of it until a June 23rd meeting when DNR Director Mark Templeton met with Nixon Chief of Staff John Watson. Gov. Nixon held a news conference on Wednesday to announce an initiative to improve water quality at the Lake of the Ozarks. The four-part plan begins with the inspection of about 400 area facilities that hold wastewater permits close to the Lake of the Ozarks of major tributaries. A Senate committee has been given 200,000 e-mails to read as it reviews why the Department of Natural Resources withheld a report on contamination at the Lake of the Ozarks. DNR drug its feet on releasing a report that parts of the Lake of the Ozarks were contaminated with E-Coli in May. "So, what normally is a 24 to 48 hour process, took nearly four weeks," Senate Commerce Committee Chairman, Brad Lager (R-Savannah) told committee members in a conference call meeting Friday morning. Lager said DNR has been less than cooperative in the committee’s review of its action. Lager insists the committee isn’t investigating DNR, merely reviewing its methods to determine if law needs to be changed to protect public health. Lager, a Republican, says he doesn’t want it to appear that a Republican legislature is investigating a Democratic Administration. DNR is part of the executive branch of Gov. Nixon. Sen. Joan Bray, a Democrat from St. Louis, told Lager that though he insists the committee isn’t investigating DNR that is how it appears. "This has all of the aura of an investigation," Bray, a member of the committee, told Lager. "And that’s what’s bothering me." While Bray is suspicious, Republican Senator Matt Bartle of Lee’s Summit said the committee must review DNR’s actions and consider whether state lawmakers need to change current policy. "If the department wants to take this to Defcon 4 and make it look like it’s some sort of criminal investigation that’s there, I guess, their prerogative," Bartle said during the conference call. For now, staff is review material provided by the DNR. The committee will likely meet in Jefferson City later. DNR has been accused of withholding the information about contamination, because the state worried about the impact on tourism.